- FrancesCassandra: UK fashion, beauty and lifestyle blog. 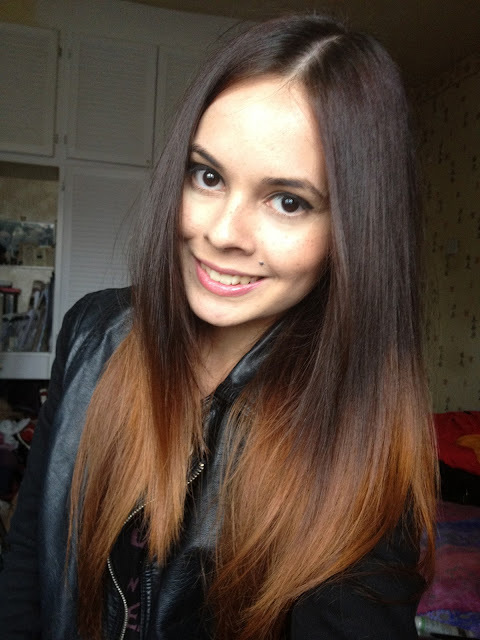 : My new ombre hair! I just thought I would do a quick post today to show you my new hair! After about six months of contemplating it I finally bit the bullet and booked myself an appointment at the hair dressers to get my hair dip-dyed. The finished result isn't how I initially planned for it to look (don't you love it when hair dressers don't listen to you) but thankfully I love it none-the-less! I was pretty nervous before and during the process, as the last time I did anything adventurous with my hair was when I was fourteen and had bright red flashes haha! I thought I would include the iPhone photograph as well because I think it captures the colour of my hair better because I didn't have to use flash, although it makes my face look horrendously washed out haha! I might update this post with better photos tomorrow when I have more adequate lighting to take them in. What do you think of my new hair colour? Have you or are you thinking of jumping on the ombre bandwagon? I love it! It looks super cute! Also! What camera do you use if you don't mind me asking? love it! i've literally just ombred my hair at home and love it! i think i'm going to lighten the ends a bit! Oh that is lovely! It actually really suits you. I know it isn't quite what you wanted but it's lovely! Your hair looks amazing, I tried this look out just by doing a few strands, I was a little scared of doing it all but maybe after seeing yours I will add a few more streaks. I love the hair! Suits you so nicely! It looks great! 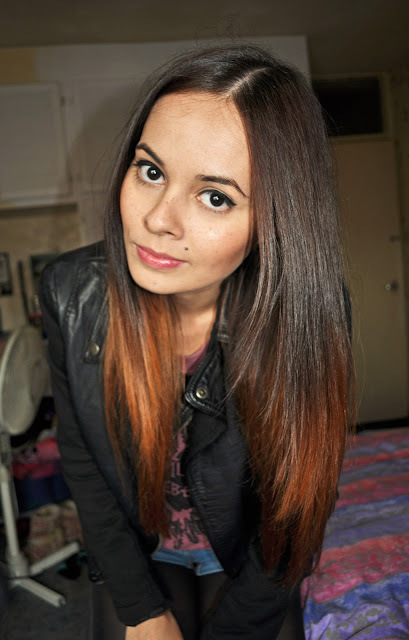 I recently decided to get my hair ombre'd but chickened out last minute! You look gorgeous though! It looks fantastic! I like its a little more subtle. Definitely a technique Id leave for a professional. So pretty! I really love how it turned out! :o your hair looks amazing! i love it! I already seriously loved your hair. I also dig this ombre twist on it. Did you want it more gold and less copper, or? You can still work on getting exactly what you wanted, but, frankly, it does look fantastic exactly as it is now!!! I've been really wanting to dip-dye my hair but I'm such a chicken haha. I know I gushed about it on twitter already but omg Frances that is absolutely bloody gorgeous! You have amazing hair anyway but this takes it to a whole new level. Serious envy going on over here! This looks so pretty and your hair is in great condition. you are so pretty! your hair is amazing, dear! Really pretty hair, it looks so lush and healthy. I love the ombre as well. It looks lovely, really nice shade with your natural dark colour! Its quite like Khloe Kardashians! I am totally in love with how gorgeous this looks on you :) WOW! !